During Xi’s first stop, in Rome, the Chinese and Italian leaders signed a memorandum of understanding signaling Italy’s participation in the BRI, a state-led investment effort that seeks to deepen Chinese infrastructure links across Asia, Africa, Europe, and Latin America. In total, Chinese investors signed twenty-nine separate deals amounting to $2.8 billion worth of projects. Most notably, they agreed to invest in port infrastructure in Trieste, Genoa, and Palermo, which could give Chinese goods faster access to Europe. Italy’s signature marks a turning point—it is the first Group of Seven (G7) nation and the largest EU member to accept BRI funds. Xi also stopped in France, where he finalized a deal to buy Airbus planes, and Monaco, which has agreed to allow Chinese telecom giant Huawei develop its 5G network. What do Italy and China hope to get out of these deals? For Rome, the BRI offers an opportunity to help a lagging economy by expanding trade and inviting Chinese investment. Italian proponents of the BRI, including Prime Minister Giuseppe Conte, have also painted the new investments as a geopolitical gambit that will boost bilateral ties. For Beijing, Italian ports offer favorable trade terms and faster access to EU markets. The port of Trieste, for example, features direct rail links to the rest of Europe and a unique exemption from customs duties. Many analysts say Beijing is also seeking to divide the EU, which is concerned with a rising China. These divisions were apparent even within the Italian government. The powerful interior minister, Matteo Salvini, questioned the deal, and his party successfully pushed for a watered-down version that limits Chinese involvement in telecommunications and other sensitive areas. What are EU and U.S. leaders concerned about? Many European countries have become increasingly worried about the national security implications of Chinese investment. Chinese bids to invest in critical sectors such as ports, energy, technology, and agriculture are causing unease, and officials are warning that allowing Chinese firms to develop telecom networks could give Beijing the ability to disrupt or spy on European communications. This has led individual countries to scrutinize Chinese deals, as well as prompted calls for an EU-wide response. Some EU officials advocate the bloc’s right to veto Chinese investments across the region. Italy, by breaking ranks, rankled French President Emmanuel Macron and German Chancellor Angela Merkel, who both met with Xi on this trip and pressured him to end practices that hurt European businesses. 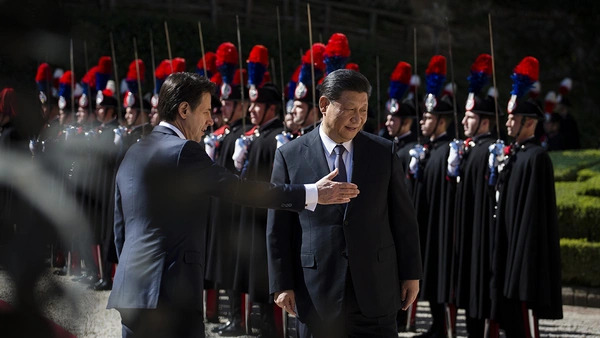 Italy counters that France’s and Germany’s trade and investment ties with China dwarf its own. U.S. policymakers are also concerned. The Trump administration lobbied against Italy’s decision, and it has been loudly urging EU countries to bar Chinese investment in 5G and other telecom infrastructure. Italy currently stands alone, and it remains unknown whether other European countries will follow suit and accept BRI funds, or whether the EU will push for stronger oversight of Chinese investment. A previous case could be instructive. In 2015, the UK became a founding member of another Chinese geopolitical project, the Asian Infrastructure Investment Bank, drawing criticism from Washington. Four years on, several other U.S. allies, including France, Germany, and Italy, have followed the UK’s lead and joined the bank. Some analysts wonder whether Italy’s decision signals that a unified front against China’s newest project will likewise crumble.